In the Fall of 2011 I consulted with the Dallas Museum of Art on how to further promote and engage their audience through the use of games. Working with both the Center for Creative Connections and the Education Department, I got to share my own experiences working with games and competitive spectacles as art, and to collaborate to build new programs for the museum. At C3, I worked with Shelagh Jessop to organize two game events for their late night public programming. Traditionally an interactive experience, the Aesthletics Late Night turned into an even more exciting contest pitting teams of all ages to compete against each other to design a new space civilization. The game worked too well; the contestants were the last remaining visitors to the museum that night and were forced out by security guards at 11pm! Working with Shannon Karol, I taught a workshop for seventy museum docents on incorporating games into their educational tours. I also worked with Melissa Nelson to develop a three week DMA sport design curriculum for the Thriving Minds after school program. 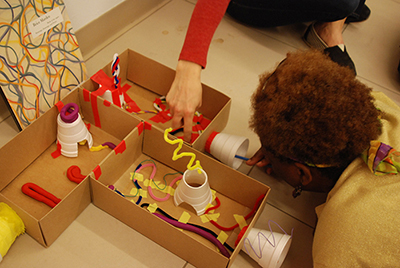 Finally, I collaborated with Nicole Stutzman to run a game design workshop for Dallas Independent School District art teachers, and to run a three day sport design worksop at Booker T. Washington High School of the Performing Arts. After a short but jam-packed three month collaboration, I departed for New York City. However a great legacy was left behind: the games council. Based on the great interest we fostered throughout the consultancy, the museum docents decided to create a games council that would meet regularly to continue to investigate how they can use games to educate and engage in their tours. The DMA, in accordance with their progressive philosophy, has fully embraced the power of games for art museums.